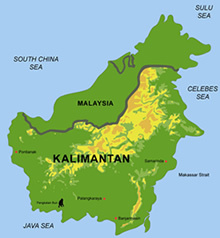 The overall aim of this Kalteng Consultants research programme is to investigate the evolution and the economic potential of the peat swamp forest (PSF) resource in Kalimantan by remote sensing techniques. A multispectral and multitemporal image analysis will evaluate the environmental importance and agricultural potential as well as wildlife conservation aspects. A land-use conversion project for rice cultivation (including transmigration) started by the Indonesian government in January 1996. It is planned to develop an area of one million hectares in Central Kalimantan, situated between River Kahayan in the west and River Kapuas or River Barito in the east and Java Sea in the South. The total area of impact may be as much as 1 million hectares. It is proposed to use the remote sensing technology for all survey and planning tasks. The paper presents some results from LANDSAT and ERS1 image processing activities. In order to undertake a global monitoring and survey in a short time it will be essential to use LANDSAT Thematic Mapper and ERS1/2 Radar images, linked to a programme of field checking of forest, peatland development and peat condition (including depth). A comprehensive literature survey must be carried out in order to assemble all published information, proceedings and institutional internal reports. All the data will be evaluated to prepare a detailed peatland analysis which will be stored in a Geographical Information System (GIS). The poposer has been established specifically to address the problems of tropical peatland survey, analysis and evaluation in Kalimantan and combines international experts in the required fields of expertise. They will use a test area of approx. 150km x 150km in the south of Palangkaraya. Key words: Central Kalimantan, Kalteng Consultants, Remote Sensing, LANDSAT, ERS 1+2, PSF-types and -depth, soil-tips, research area near Sungai Sebangau, 1 Mio. ha rice project, Soft-Ware: ENVI-IDL, Multitemporal and Multispectral Image Analysis:Image statistic (greylevels, histograms, variance, co-variance), RGB, NDVI (Vegetation Index), Hyperspectral Analysis with Z-Profiles Image enhancement: filtering, contrast stretching: linear, 2%, equalisation, Gaussian, Square Root Min, Image Classification: Supervised (Maximum Likelihood Class, Minimum Distance Class., Spectral Angle Mapper, Mahalanobis Distance Class., Neural Net Class.) Unsupervised (IsoData Class.) Image Fusion, Change Detection, GCP, Warping, RST, Mosaicking, Geocoded Mappings, UTM and Printing. 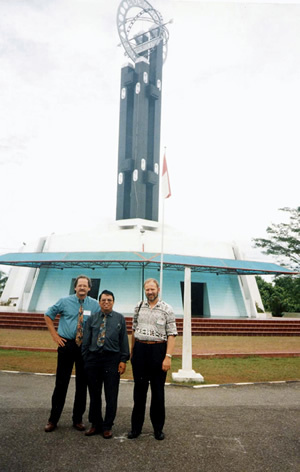 Grids, Annotation, GIS, Remote Sensing Technology Transfer to Indonesia.